What makes people successful? Is it education? Is it money? Is it something beyond the understanding of humans? Does it require certain skills? Is it just hard work? Is it just a matter of being at the right place in the right time? Is it because they had the right people to guide them? If you have been asking yourself these questions, then you are in the right place. While it is true that almost all the things mentioned above are true to some extent, no one can deny that it takes more than sheer luck to become a success. It requires a lot of hard work. It requires a lot of focus, planning, and management. It requires learning and education. It requires availing oneself of the right opportunities. Success also involves the willingness to take risks and make challenging decisions at the right time and in the right place. Success requires getting rid of negative attitudes and replacing them with positive ones. It requires you to be open to new challenges that take you beyond your comfort zone. Success also requires a person to be constantly learning, changing, adapting, innovating, and keeping up with the times. While all this is easier said than done, it is definitely not an impossible task. 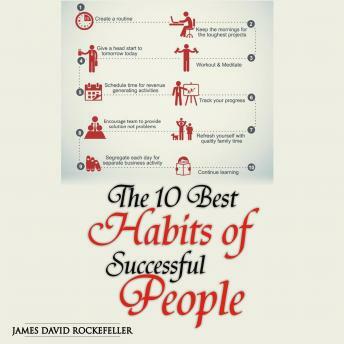 If you want to be successful, you need to adopt the habits of successful people. The list of good habits is virtually endless and may vary from one individual to the other. But here in this guide, we will be discussing the 10 best habits that can put you on the road to success. So, let's get started!